The following is a list of several games & interactive options that we have available to add to your event. Most of these options can be added with no additional cost. However, there are a few that are available with a slight addition charge. If there is an addition cost involved, the price is listed next to that particular item. Since we do not automatically bring all of our options to every event, you must inform us prior to the date of your event if you would like to include any of the options at your event. If you have additional questions, or if you would like to add any of the options to your event, please feel free to contact us. Up to 10 contestants can participate at one time. 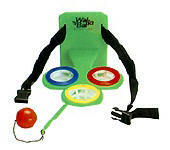 Contestants strap the Walla – Balla device around their waist, then with their hands locked behind their back, they must jump, wiggle, or bounce and try to get the ball into one of the 3 hoops. We keep score & the person with the most baskets in a given period of time wins. This contest allows up 30-35 people to compete at the same time. We take 16 hula hoops and place them on the floor in a large circle. The hoops consist of 5 colors: Red, Blue, Green, Yellow & Purple. All of the contestants stand inside of the hoops and we begin to play a custom pre-recorded audio track. As the track plays, the contestants move in a clockwise direction through the hoops. Occasionally, the audio track will skip to a different unique song. When the track skips, the contestants must stop moving. Depending on the song that it skips to, some contestants will be eliminated. If the song that comes on is Purple Rain by Prince, everyone standing in a purple hula hoop is eliminated. If the song is Yellow Submarine by The Beatles, everyone standing in a yellow hula hoop is eliminated. This continues until there is only one contestant remaining and that contestant is the winner. We invite 6 people up to the dance floor (works best if we are provided the names of 6 people ahead of time – without their knowledge). We line them up, facing the audience and begin to place the “Village People” hats on them. They are then required to lead everyone through the Y.M.C.A. and do their best “Village People” impersonation. You could turn this into a contest by having the audience vote (by applause) for the best performance. Works great at a wedding using the groomsmen & groom as the “volunteers”. 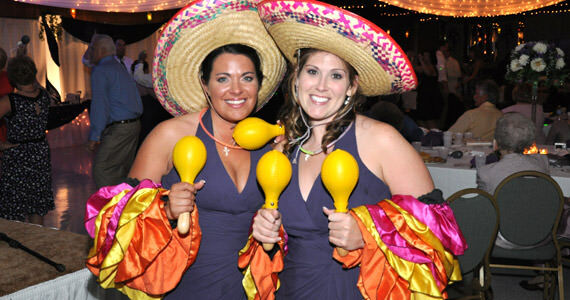 We take 2 volunteers into another room, get them outfitted in conga sleeves, sombreros and maracas. When introduce them into the room & they lead a conga line. Works great at a wedding using the mothers of the bride & groom or one set of parents. Provide us with 5 volunteers (the more outgoing they are, the funnier the result). We take them in to another room and get them outfitted in huge black afros, dark sunglasses and plaid sport coats. We then introduce them into the room as a “special celebrity guest appearance”. They gather guests from the crowd and dance to “Play That Funky Music”. Hula hoop contests have been around for a long time but are still a big hit. We can have up to 10 contestants participate at one time. Another oldie but goodie. We usually ask for 2 adult volunteers to be “Limbo Pole Holders”. This is a good contest to allow everyone a chance to participate. You provide us with your favorite photographs. Your photographs are then digitally captured and arranged in a computer generated multimedia presentation. On the day of your event, your guests will be amazed as we project your photos onto a 5 foot high x 7 foot wide video screen. Each photo is displayed for approximately 5 seconds. Then, as one photo fades out the next photo smoothly fades in using special effects such as pans, dissolves and wipes. All of this is set to music, which you choose. You can view more details about the photo montage service here. This is a fun way to give away your centerpieces. We announce that we are going to have a contest & everyone will have a chance to win a prize. We ask for one person at every table to provide a dollar bill. Next, we ask that person to stand and place the dollar bill in their right hand and wave it high above their head. Now, they pass the dollar bill 3 places to their right and they are seated. The person that now has the dollar bill stands and places the dollar bill in their left hand. We ask them to turn around in a circle 2 times and pass the dollar bill 5 places to their left and they are seated. The person that now has the dollar bill stands and holds the dollar bill in both hands high above their head. At this point we ask everybody to give them a big round of applause because this person just won a fabulous prize “a dollar bill”. We ask that person to be seated and ask the person that provided the dollar bill for the table to stand once again. We then announce that since they donated the dollar bill, they also won a prize “the centerpiece on their table”. We have many line dances available, such as The Electric Slide, The Cha Cha Slide, The Macarena, The Wobble, The Cupid Shuffle, Strokin’ and more. Also, don’t forget your traditional wedding dances such as the Chicken Dance and The Hokey Pokey. This is a team relay to build the largest Santa or Fireman, depending on the time of year. You assign 2 teams of at least 6 people per team. Teams are divided into 1-captain, 2-transporters, 1-stuffer, and at least 2-builders. The captains and stuffers are at one end of the room. The builders are at the other end of the room. We outfit the captains in huge red jumpsuits then throw several handfuls of balloons on the floor in front of the builders. Once we start the music the builders must blow up & tie the balloons, give them to the transporters who must take the balloons to the other end of the room WITHOUT using their hands. The stuffer then takes the balloons and stuffs them into the captains red jumpsuit. This continues for approximately 4 minutes, the team with the most balloons stuffed in the jumpsuit after this period of time wins. There are many different “Party Props” available. Party Props are small props which you purchase for use at your event and your guests get to keep. You decide which props and how many you would like to include and we use these props to help enhance your event by incorporating the props in to the music. Some examples: We toss out 2 dozen gangster hats & cool sunglasses and your guests imitate Michael Jackson or The Blues Brothers. We give out 2 dozen blow up guitars while your guests all dance to Elvis Presley or Joan Jett. The possibilities are endless. You can view the most popular Party Props by clicking here. Keep in mind that we do not sell the party props ourselves. You must order the party props from a supplier such as Rhode Island Novelty. This can be done with large groups. The group is broken up in to a couple of teams. Each team designates a “captain” the captains all come on to the dance floor where they are shown a piece of paper with a word on it. That person then has to spell out the word by moving their hips (spelling the words with their butts!). They are not allowed to speak or give any type of clues. If their team does not figure out the word after two spellings, the other team gets to guess. You can also work this as a timed event, to see which team is able to guess their word the quickest. A normal game consists of several rounds. You can make it interesting by the words you choose. However, try to keep it clean. We don’t want any dirty butts! Divide up in to 3 teams of 2 people each. Contestants stand facing their teammate with arms extended out. We then apply ropes to interlock contestants, they must then attempt to separate from each other without removing their hands from the loops in the ropes. We allow about a 3 minute deadline. Contestants usually end up in very funny positions and rarely are able to figure out the secret. We begin by placing four mats with the letters A, B, C, D, in each of four corners. Everybody huddles in the center of the room. We ask a trivia question with multiple-choice answers. All contestants run to the corner they believe is the correct answer. Any contestants at the wrong corners are eliminated, the remainders go back to the center and the game continues until there is only 1 left. This is an excellent game for Bar Mitzvahs & Bat Mitzvahs where the questions would all be related to the guest of honor. Keep in mind that you will need to provide us with at least 25 multiple choice questions prior to the event. This contest requires 2 or 3 teams of at least 3 people per team. (2-runners 1-holder). The holder stands at one end of the dance floor with a plastic tray in their hands. The 2 runners are at the other end of the dance floor each with a stainless steel spatula in their hands. We spread out a couple of bags of cotton balls on the dance floor and start the contest. The runners must keep 1 hand behind their back at all times and the object is to scoop up as many cotton balls as possible, using only the spatula and place them on the tray. DJ calls out “switch” approx. every 15-20 seconds at that point the runners must drop any cotton balls they have on their spatula, run back and give the spatula to the next runner in line. The team with the most cotton balls on their tray at the end of a song wins.